When looking around for terrain pieces and the like, I found some cool resin bases scaled for 15mm figures from CAMA models and Kerr & King. Are there any other manufacturers that make similar bases? Those are very cool. Thanks mate. To a New Yorker like you a hero is some kinda weird sandwich, not some nut who takes on three Tigers! 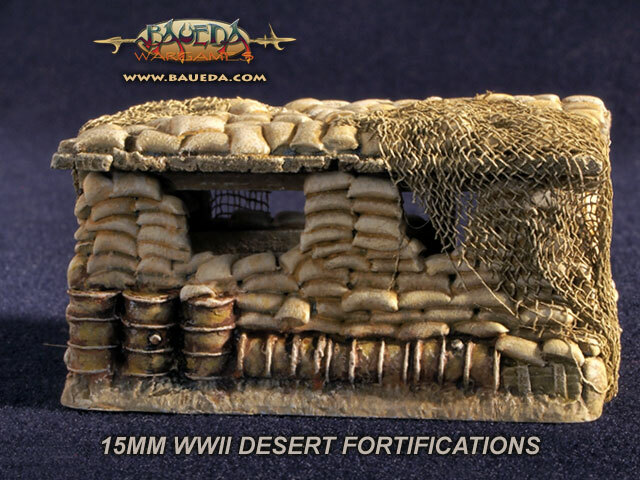 if you like those, check out the new BAUEDA 15mm WWII Desert Fortifications! As you probably know currently our range already include over 30 different packs of scenic bases, objectives, bunkers, fortifications and entrenchments, covering rural and urban theatres and including also a couple specifically designed with a desert theme. We now want to add a number of new codes to complete the desert series, including a couple of sandbag bunkers, pop on http://igg.me/at/baueda-wargames/ for a chance to get your fill of very high quality products with a substantial discount and you can get them even before they are added to our catalog and begin to ship to retailers worldwide! Are the special Resin Bases included in the Starter Set Hero/Villain Bundle Deal or are they separate?